Customers want an answer, and they want it now! 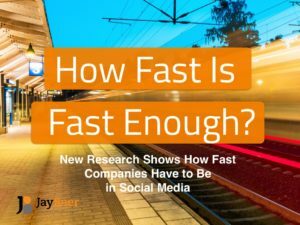 New research from Jay Baer—included in Hug Your Haters, his best-selling book about customer service—shows precisely how fast companies need to respond to consumer questions and complaints on Twitter, Facebook, Instagram, and beyond. This presentation and the corresponding research is a must for anyone in customer service, social media, digital marketing, customer success, and all business owners and managers that care about customer service, customer experience, customer retention, and customer satisfaction. For a LOT more on this topic, see HugYourHaters.com.